It was their third day on the mountain. Temperatures had plummeted to 20 degrees below zero. The rain had finally stopped, but a harsh wind had risen up, and it was unforgiving. Sisters Natalia Luis and Cidalia Luis-Akbar were cocooned in layers upon layers of heavy, water-resistant clothing, but the chill cut right through. It got into their bones and wouldn’t leave. They had reached the Lava Tower, at about 15,000 feet, but their grueling, six-day climb to Mt. Kilimanjaro’s summit was only halfway over. Natalia looked her sister in the eye and told her she couldn’t make it. Rewind about a year and a half. And they decided to do something big. Mount Kilimanjaro is the tallest free-standing mountain on Earth, but Cidalia, 46, and Natalia, 42, who were born in Portugal, said they were unintimidated by its enormity. To them, the massive peak in Tanzania dwarfed in comparison to the astonishing parade of personal tragedies and professional setbacks they had already weathered by the time they decided, that day in Arizona, to just climb the thing. The trek would be more than a bucket-list stunt; they opted to seek sponsorships to raise money for Children’s National Medical Center in Washington, D.C. So far, they’ve raised about $250,000. But the eight-day journey — six days up, two days down — turned out to be far more difficult than either woman imagined. They endured the dull, unending headaches of “altitude sickness,” the lack of sleep, the mental fatigue. And the pain — lots of pain, particularly for Cidalia, who had back surgery about six months earlier. Speaking from M. Luis Construction’s Silver Spring office about a week after returning to the U.S., Natalia recalls how on the third day of the climb, she simply couldn’t get warm. She couldn’t keep food down, and she was getting dehydrated. She was ready to turn back. But their guide, Johnny, intervened. He prepared Natalia a hot water bottle — no small task in sub-zero temperatures — which she said drove away the chill. Finally, she fell asleep. 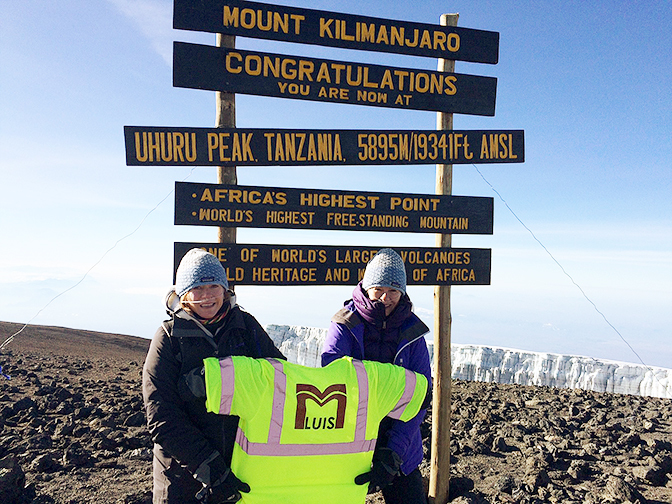 Two days later, just before Thanksgiving, both sisters reached the summit, at 19,341 feet. The top two executives at M. Luis Construction, a regional asphalt manufacturing and construction services company, don’t run marathons. They aren’t adventure-seekers. Before scaling “Mt. Kili,” as they call it, they’d barely even hiked. Overcoming obstacles, however — that they were familiar with. “Resilience is built into our very fiber,” Cidalia said. It started more than a decade ago, when Cidalia lost her first child, Joseph, in utero. Six more children would follow; all of them died in her womb. Then, she battled and survived cancer. And finally, in 2009, Cidalia gave birth to a daughter, Sophia, now a healthy five-year-old. But the family couldn’t catch a break. It was December 2010, in the depths of the Great Recession and two years after the sisters took over M. Luis Construction, which their parents founded in 1985. They had just closed on an asphalt manufacturing plant in Rockville, but money was getting dangerously tight. Plus, the sisters said, others in the industry weren’t happy about the acquisition. The plant was in an ideal location, and other companies wanted it. “If you look at all the plants in Maryland, they’re either owned by the big multi-national corporations or by multi-generational family companies,” Natalia said. Still, the sisters press on. Then came the fire. Feb. 19, 2011, the company’s massive central operations hub in Laurel went up in smoke when a neighboring mulch factory catches fire. Nearly 30 trucks, plus eight cargo containers packed to the brim with inventory, all melt. It was just a few weeks before the start of construction season. “I can’t even put into words how devastating that was,” Natalia said. Just as M. Luis Construction started to bounce back from the fire, Mother Nature dampened their spirit — literally. In a typical construction season, there are about 38 so-called “rain impacts” — the number of day or nightshifts that get rained out. That year, there were 94. After so much trauma, Cidalia and Natalia said climbing Mt. Kilimanjaro allowed them to heal. When the climb got tough, the sisters would read notes from patients and staff at Children’s National Medical Center. Every dollar raised for their climb will go to the hospital’s Fetal Medicine Institute, specifically for development of technologies that will enable physicians to diagnose various conditions in utero, saving precious time after the baby is born that could be used to perform surgery or start medication. The diagnostic tools that are developed will then be shared with providers nationwide and across the globe, including in Tanzania. Inside the M. Luis office, even guests are treated like family, but it’s clear who shares a bloodline. Neither sister goes five minutes without laughing. They hug everyone, and they love sweets. They both have a penchant for the word “extraordinary,” though they pronounce it differently. Still, their personalities are distinct. Natalia is chattier; Cidalia speaks more slowly. Natalia says she’s more in touch with her inner self; Cidalia says the heightened self-awareness she felt on the mountain was uncommon for her. Both said having a partner with different viewpoints makes them better leaders. She searches for the right word. “… Complement each other,” her sister finishes. Cidalia said they hope to inspire others to “find creative ways to be philanthropic,” even in difficult financial times.